Check it out at https://attackathon.com! We were frustrated by the experience of repeatedly forgetting passwords and the increasing number of privacy leaks that expose password data. This inspired us to create a way people could log in to their services with something that was intrinsic to them and was easy to input. 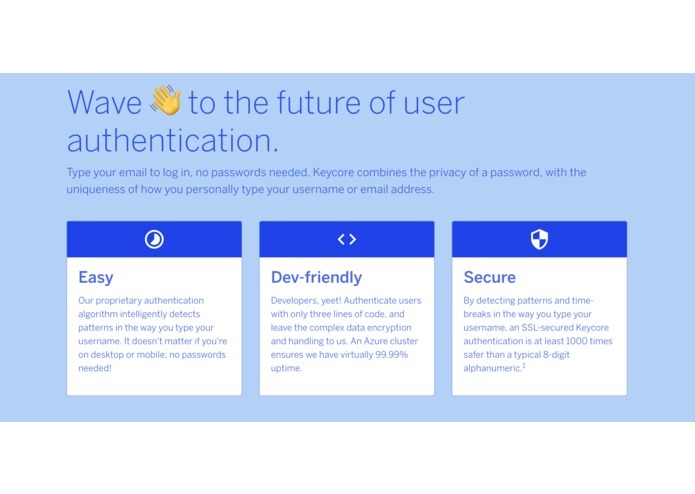 Keycore is a tool that allows users to login with their email alone--no passwords needed. 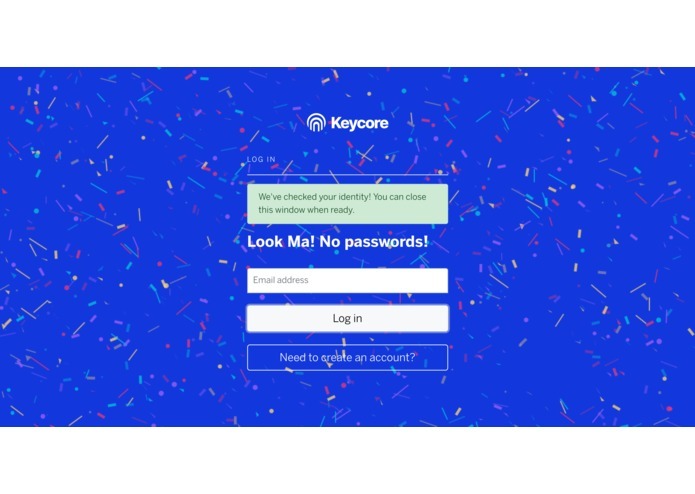 Keycore uses the data from the way you enter your email and is able to confirm with accuracy significantly greater than normal passwords that you are who you say you are. Keycore is a turnkey solution for engineers who are developing applications to take advantage of this novel form of authentication. 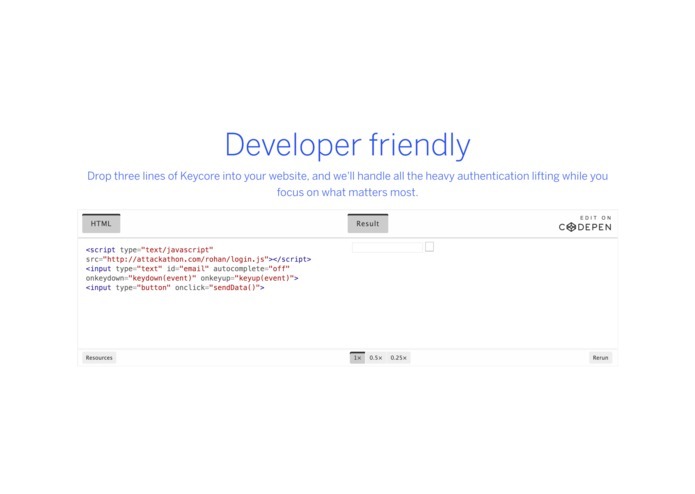 With just three lines of Keycore code, all the heavy lifting of authentication is done already. One major challenge we ran into was being able to make sense of the data in an efficient way. After collecting a significant amount of data from each time a user logs in, we had a bit of trouble understanding how exactly to analyze it. However, we developed an efficient and precise algorithm that can analyze the data and authenticate a user. The future of Keycore is very bright. We have developed a developer friendly solution that eliminates the major problem of forgotten passwords for users. In addition, the elimination of passwords released in more privacy given to the user and perhaps an end to this era of data leaks. We would like to continue to develop this and work with cryptographic experts to ensure Keycore is secure beyond doubt. After that, we are planning to begin integrating Keycore into existing sites and begin marketing Keycore to more and more companies. I developed the backend server on an Azure Virtual Machine using Flask and MongoDB. This backend includes the code that analyzes the difference in keystrokes of entering email addresses, using adaptive machine learning to recognize the user better after repeated authentication. 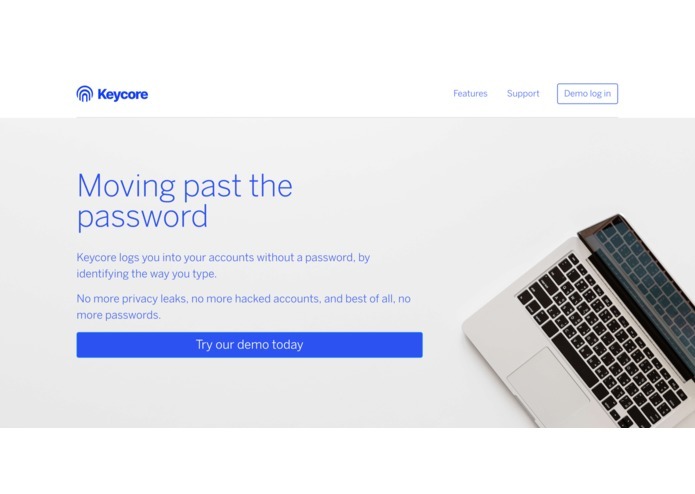 I was the principal front-end developer for Keycore, as well as the UI/UX specialist who built the appearance and interactivity of the website. I worked in Bootstrap and Typekit, as well as Illustrator, Photoshop, and Inkscape.